Several years ago, when we still lived in Ohio, we took ourselves to a local small town festival. Not just any festival though. Mid October if you head to Circleville, Ohio you will find a happy quaint little town celebrating pumpkins. Lots and lots of pumpkins. Besides the normal fair activities, we were also enthralled with displays of pumpkins of all sizes. Pumpkins, pumpkins,and MORE pumpkins. Then there was the pumpkin inspired food. Pumpkin burgers, pumpkin donuts, pumpkin ice cream, pumpkin pie, pumpkin butter, pumpkin bread, and pumpkin chili. I haven't forgotten that sweet little Pumpkin Festival. I haven't forgotten that sweet little bit of Midwestern Fall. Thanks to my reminiscing, I seemed to remember that pumpkin can go in more than just pie and bread. I mean don't get me wrong it I quite enjoy pumpkin bread, as you might recall from my recent recipe for Chocolate Chip Pumpkin Bread. Recently we had a chillier day, which by it's very implication means I must make chili. 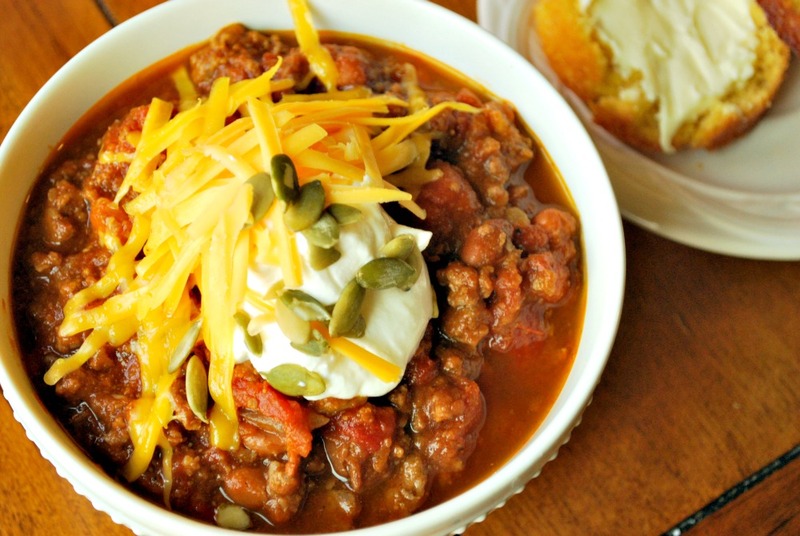 Chili+Fall+Pumpkin Festival memories= PUMPKIN CHILI. This recipe is just my kind of chili. It is a hearty chili but not overly spicy. The pumpkin is just lovely. Then add in a little bit of brown sugar and some pumpkin pie spice and BAM, this chili is brought to a whole new level. Pumpkin spice and brown sugar, "what is this a pie?" Don't judge it till you try it. The taste of this chili is great. Just trust me. Top it with sour cream, cheese, maybe some toasted pumpkin kernels. Oh and don't forget the corn bread. In a large stock pot or dutch oven, brown beef or turkey with the chopped onion. Drain excess grease. Add in all the remaining ingredients and stir well to mix. Bring to a boil, then reduce the heat and simmer for 1 hour. Serve with grated cheese and sour cream. Thanks for reading, you are grand. Wasn't sure about this and it taste good, butttttt the next I make it I will omit the pumpkin spice, too strong. I used pinto beans, I'm in Texas. I added more chili powder, garlic and cumin to try and tone down the pumpkin spice. Anxious to see what my husband thinks about it. This is seriously so yummy! I'm making it for the second time, right now. I think the spices are perfect, as measured! Thank you! Yay! I am so happy you enjoyed it! 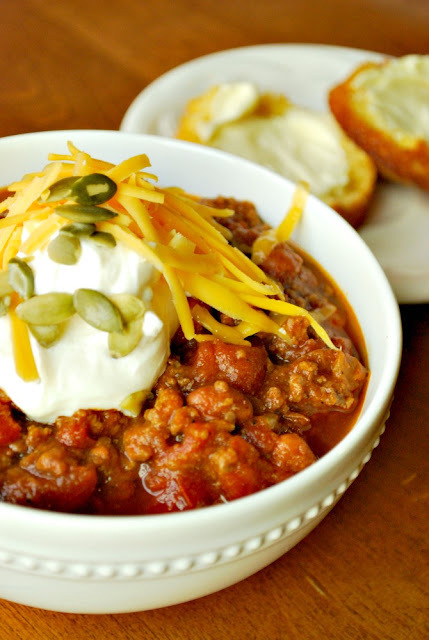 My favorite chili is a vegetarian pumpkin peanut butter chili. You'll love it! I love this recipe! I make this multiple times a year during the fall/ winter months! I make a vegetarian batch for my husband as well using veggie broth and morning star crumbles! Thanks for this one! Can you put this in the crockpot? McKenna, I don't see why not. Thank you so much for posting this! I'm on a paleo diet so I left out the beans and brown sugar, but I can still say this is the BEST chili I've ever had. Thanks again!! What kind of chili sauce are you talking about? Silvia, it is a chili sauce that is found by the ketchup. I have made this recipe so many times now! We LOVE it! The shredded cheese & sour cream really compliment it too! My meat packages make this recipe closer to 3 pounds of meat so I use the whole can of pumpkin, add 2 cans of beans and about 1-1/2 cups of broth. It is perfect! Thank you so much for sharing this recipe! I'm so happy you mentioned the Pumpkin Show. Circleville is my hometown, and we look forward to it every year. The Pumpkin Chili is amazing! !